75 Pages - 8 1/2 x 11 Spiral Bound. In 1996 Alexandriah published the informational fruits of her healing research in her Implant and Imprint book called Implants and Imprints: A Healer’s View of Ascension Clearing. Today this Implants and Imprints book is still the most comprehensive explanation of the subject of Etheric Implants and Alien Implants and Imprints and Spiritual Limitation Devices. 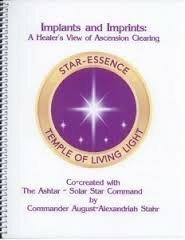 Although this Implant and Imprints book will NOT remove your Implants and Imprints, it will give you the information you need to trust that Alexandriah Stahr is both the original and most trusted source for having your Etheric Implants, Alien Implants and UFO Alien Implants removed. Order Now! If you are outside the USA, Do not purchase through the website, instead contact Alexandriah for shipping rates. If you are also ready to have your Etheric Implants, Alien Implants and/or UFO Alien Implants removed today, then you can also prepay for your First Time Caller Special or the 2 Week Fast Track Program.